psychology services firm for couples therapy. Couples looking for counseling and help with their relationship and marriage. We are experts on relationship and we can solve your problems. If you need help with your relationship, we can help you. 1. Take Route 93 south towards Boston. 2. Coming over the bridge stay to your right hand side and watch for the sign that says "Storrow Drive." 3. Take Storrow Drive Exit and follow Storrow along Charles River. Be watching for the "Kenmore Square/Fenway Exit." 4. Take " Kenmore Square/Fenway" Exit, stay to the Kenmore Square side (right side). 5. When you come to the first set of lights off the exit go straight, (get left) at the third set of lights, turn Left onto Commonwealth Avenue. 6. We are the first building on your right. 7. 416 Commonwealth Ave., #607, Boston MA 02215. Ask concierge for Dr. Gloria Spitalny. 1. Follow the signs for the Storrow Drive Exit. 2. Take Storrow Drive exit and follow it along the Charles River. Be watching for Kenmore Square/Fenway Exit. 3. Take Kenmore Square/Fenway Exit, stay to the Kenmore Square side ( right side). 4. When you come to the first set of lights off the exit go straight (get left), at the third set of lights turn left onto Commonwealth Avenue. 5. We are the first building on your right. 6. 416 Commonwealth Ave., #607, Boston MA 02215. Ask concierge for Dr. Gloria Spitalny. 1. Take the Copley Square/Prudential Exit off the Mass. Pike. 2. Once on the exit follow the Prudential signs (bear left). When you get off the exit stay in the right lane and take a right at the first set of lights. 3. Bear right at the fork and continue on road that runs between The Back Bay Hilton and The Sheraton Boston. 4. At the next set of lights you will cross Boylston Street (passing to the right of the fire station) and take a left onto Newbury Street. 5. Follow Newbury Street to Massachusetts Avenue. At this intersection, go straight across Mass. Ave (be careful not to re-enter the Mass. Pike) to Newbury Street Extension. 6. At the end of the street is Charlesgate East. Make a right onto Charlesgate East and another right at the first traffic light and you will be at the front of the building - 416 Commonwealth Avenue. 1. From Logan Airport take the Sumner Tunnel to Route 93 North. 2. Follow 93 North for a short distance and take Storrow Drive exit. 3. Follow Storrow Drive West, keep to the right, along the Charles River. 4. Take Kenmore Square exit off of Storrow Drive. 5. Once off the exit, go to third set of lights and take a left onto Commonwealth Avenue. 6. We are the first building on your right.416 Commonwealth Avenue. 1. Follow Route 2 towards Boston. 3. Take Storrow Drive east and follow along the Charles River, until you see the exit for The Fenway/Kenmore Square. 4. Take the exit, staying to the Kenmore Square side (your right side). 5. When you come to the first set of lights off the exit go straight, at the third set of lights turn left onto Commonwealth Avenue. 4. Walk west (cross street) past the Eliot Hotel, Harvard Club and continue walking. 6. On the same block at the opposite end, is the office building. 7. Enter 416 Commonwealth Ave., #607, Boston MA 02215. 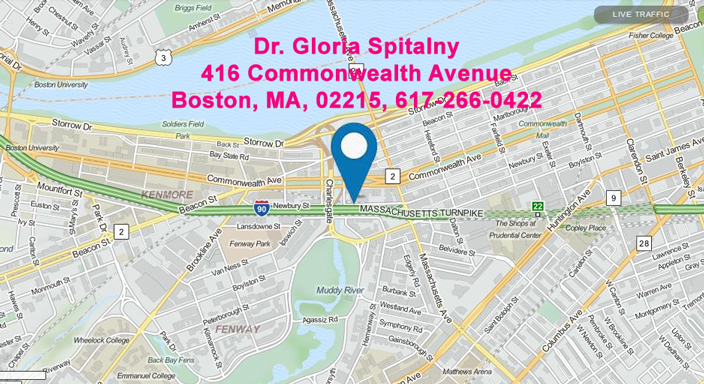 Ask concierge for Dr. Gloria Spitalny. Most convenience parking in Boston. There are over 150 parking spots all around the building. Bring Quarters. These are metered, 2 hour parking in the front and back of the building on Commonwealth Ave. Bring 4 quarters per hour. This is considered the easiest place to find parking near Newbury Street. There are over 100 additional parking spots at the back of my building. Go to the end of the block and turn RIGHT onto Mass Ave. Take first RIGHT at the next intersection, the continuation of Newbury St. There are over 100 hundred parking spots with metered, 2 hour parking on both sides of the street, making this area, the easiest place to park in Boston.